Located 100 kilometers / 63 miles to the south of the Cancun airport on Mexico’s Riviera Maya, the drive to Akumal Bay from Cancun takes just under an hour and a half. Highway 307 from Cancun runs the entire length of the Riviera Maya and there is a highway exit for Akumal with signs. This is Akumal’s main entrance, which also leads to Akumal’s main beach, Half Moon Bay and to Yal Ku Lagoon. Also referred to as Central Akumal, Akumal Bay is in the heart of Akumal’s main area and is located directly in front of Akumal’s main entrance archway. 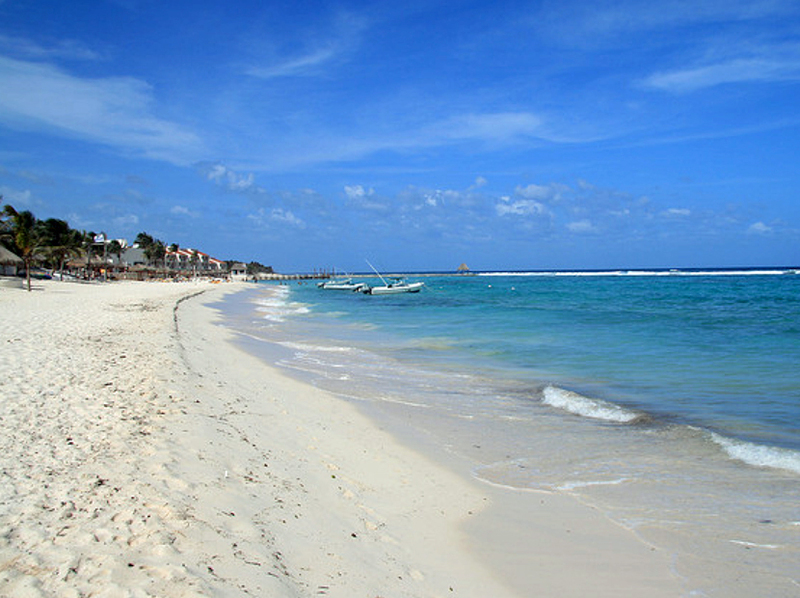 Also known as “the main beach” or the “public beach”, the beach itself starts at the northern end of Akumal Bay and runs southward, eventually running into the beach at Jade Bay. With its wide area of sand, shallow waters at the beaches edge, large area of sandy sea floor, and the fact that it is typically calm with little surf, all make this beach one of the best in the area for lounging in the shallows and for children to play in the sea. 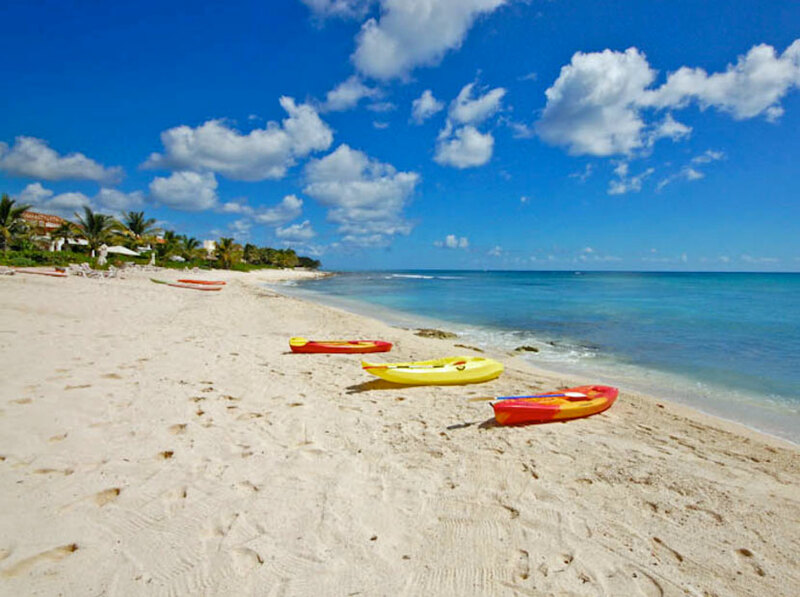 For the same reasons, the beach at Akumal Bay is one of the most popular for snorkelers, attracting guests staying elsewhere in Akumal and elsewhere on the Riviera Maya, spending from a few hours to the entire day, relaxing, swimming, and snorkeling. 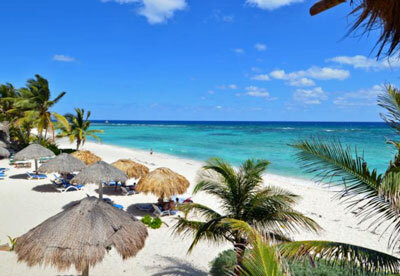 With many of Akumal’s amenities also located at the main beach area, such as; dive shops, beach bar, and restaurants, it is the busiest beach in Akumal, with the winter season being the busiest of the year. 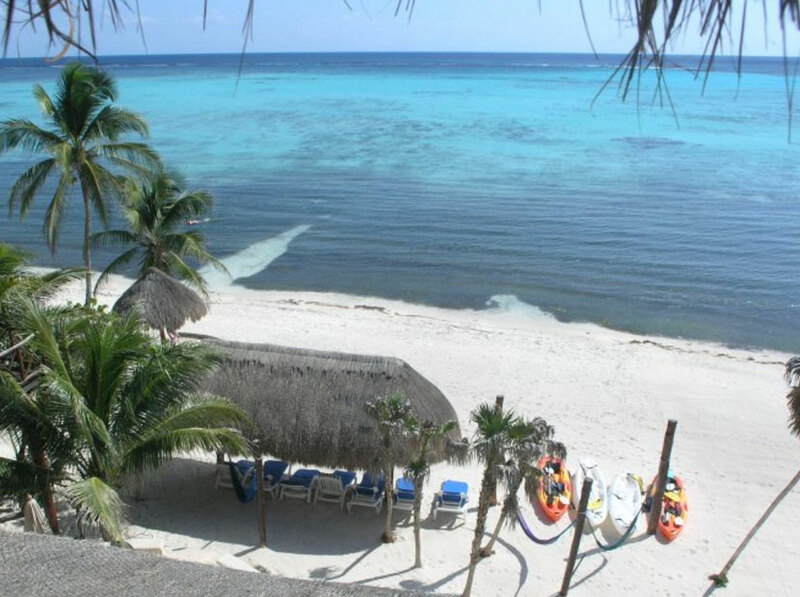 Located on the beach at Akumal Bay are The Akumal Dive Shop, The Beach Bar, Lol-Ha Restaurant, Akumal Dive Center, Hotel Club Akumal Caribe, Akumal Beach Resort, and Secrets Resort. Although there are relatively few places to stay at Akumal’s main beach, there’s no cost to use the beach itself and guests staying at nearby Half Moon Bay, can easily walk, ride a bike, or drive (there’s a small fee for parking), and use the main beach to swim, snorkel, dine, or just have a few cocktails at The Beach Bar. If staying at Jade Bay Bay, the main beach is about a 20 minute walk along the shore and from South Akumal, it can take up to an hour. When staying at these two locations, we recommend that guests have a rental car to commute to and from Akumal’s main area. The barrier reef in front Akumal Bay has created a shallow, protected area, providing excellent snorkeling that is easily accessed from the beach. 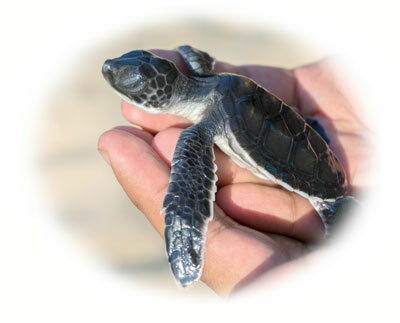 Inside the bay, snorkelers can see a wide variety of coral, tropical fish, and sea turtles. At the waters edge, the beach is sand with large areas of sandy ocean floor. It’s a relatively short swim out to the barrier reef from the beach, with depths ranging from just a few feet up to about thirty feet at “the cut”, where dive boats and fishing boats exit the bay and enter the open sea. 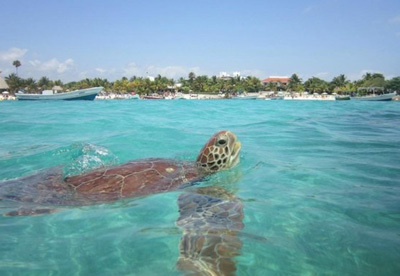 If snorkeling at Akumal Bay, remember, always stay inside of the bay and within the protection of the barrier reef. Snorkel gear can be rented at the dive shops located on the beach at Akumal Bay or you can bring your own. 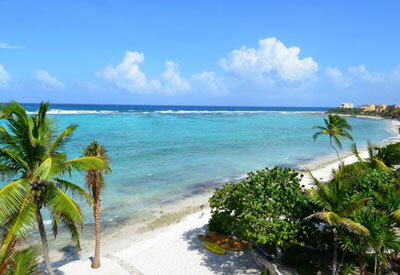 Located just 1 kilometer to the north of Akumal Bay, Half Moon Bay is within a 20-25 minute walk, or a short bike ride or drive of Akumal’s main area. From Akumal’s main entrance is a quiet, residential road leading to Half Moon Bay, which then continues north and ends at the beautiful, Yal Ku Lagoon. The beach at Half Moon bay is a crescent of white sand, with a rocky point at each end. The beach is widest at the center of the bay and it slowly narrows, as you get closer to the rocky points. Protected from the open sea by the barrier reef, this beach is typically calm, with surf in the center of the beach reaching about knee high on days that have choppy seas. 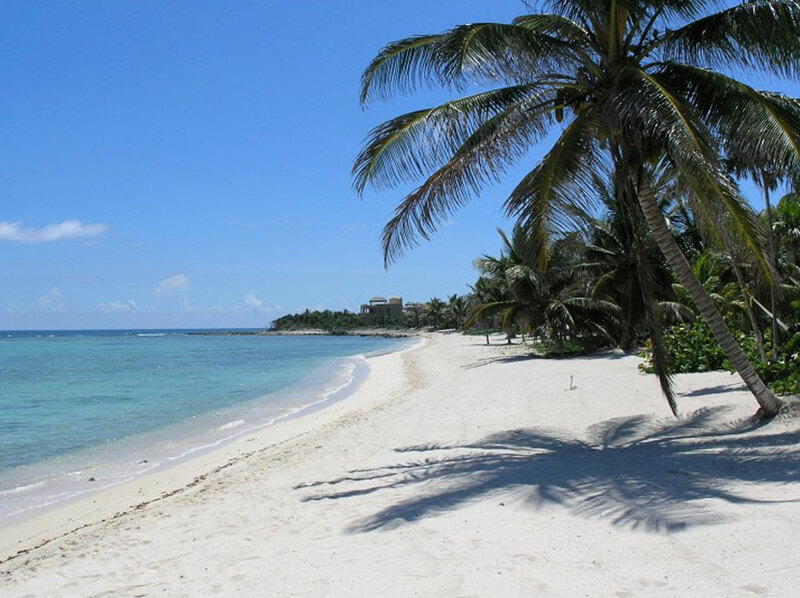 This beach is primarily used by guests staying on Half Moon Bay, therefore, it is typically a quiet beach without crowds, even during Akumal’s busiest times. Also, because it is removed from Akumal’s main area, the beach at Half Moon Bay doesn’t attract day visitors, as does Akumal’s main beach. Half Moon Bay is home to numerous small, quaint, beachfront condo properties, villas, two restaurants, a dive shop, and there are several convenience stores nearby. As mentioned above, Akumal’s main area is within walking distance or a short drive, and there you will find even more restaurants and amenities. The barrier reef in front Half Moon Bay has created a shallow, protected area, providing excellent snorkeling that is easily accessed from the beach. 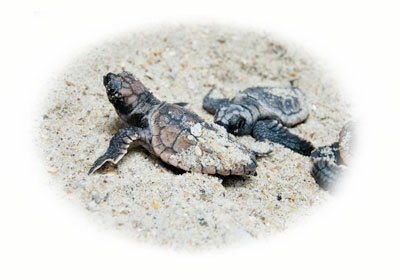 Inside the bay, snorkelers can see a wide variety of coral, tropical fish, and sea turtles. At the waters edge, the beach is sand, however, when entering the water for snorkeling, there are patches of sandy ocean floor as well as patches of round rocks (ancient coral) which shift location on the sea floor with the tides. If there is a patch of these round rocks in front of where you are staying, you can always walk a short distance in either direction to where there is a patch of sand end then enter. Once in the water, you can easily snorkel out to the coral reefs and explore the bay. Located just under 1 kilometer to the south of Akumal Bay, Jade Bay is within a 20-25 minute walk along the shore of Akumal’s main area. When driving, exit Jade Bay and drive north on coastal Hwy. 307 until reaching Akumal’s main entrance road. Turn right and proceed straight to Akumal Bay. The beach at Jade Bay is located on the same stretch of shoreline as Akumal’s main beach, just a little further to the south. Although named “Jade Bay” it’s more of a small cove within the larger Akumal Bay. The beach is a crescent of white sand, with some patches of rocks scattered here and there along the waters edge. At each end of this beach are areas where rock and sand mix. To the north is Akumal’s main beach and to the south is the beach of South Akumal. Although protected from the open sea by the barrier reef, the coral is a little deeper beneath the surface of the sea here, allowing waves to partially rebuild in height as they cross the bay and approach the beach. When seas are calm, there is very little surf and when the seas are choppy, waves reach about knee high before breaking at the beach line. 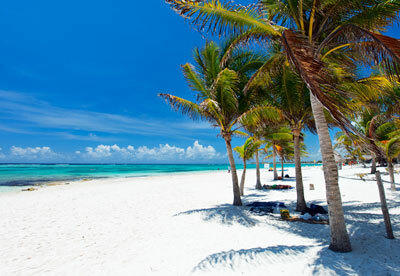 This beach is primarily used by guests staying at Jade Bay, therefore, it is typically a quiet beach without crowds, even during Akumal’s busiest times. Also, because it is removed from Akumal’s main area, the beach at Half Moon Bay doesn’t attract day visitors, as does Akumal’s main beach. Jade Bay is home to numerous private villas and several low-rise condominiums properties. 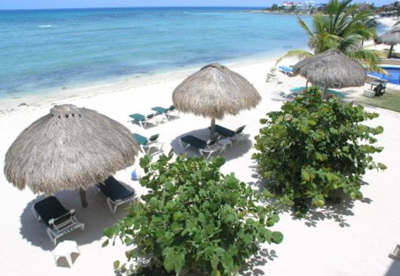 Akumal’s main area is within a 20-25 minute walk along the shore or a short drive on Highway 307. Jade Bay offers easy access snorkeling from shore, however, on choppy days it’s best to walk northward toward Akumal’s main beach, where there typically aren’t the small waves found at Jade Bay. Snorkeling is easily accessed from the beach. 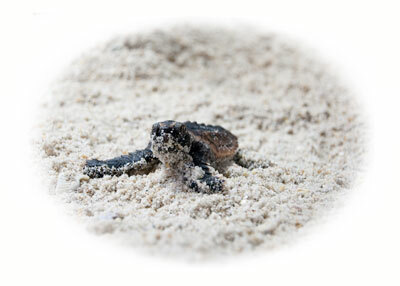 Inside the bay, snorkelers can see a wide variety of coral, tropical fish, and sea turtles. At the waters edge at Jade Bay, the beach is mostly sand with some areas of rock, however, if there is a patch of rock in front of where you are staying, you can always walk a short distance in either direction end then enter the sea. Once in the water, you can easily snorkel out to the coral reefs and explore the bay. 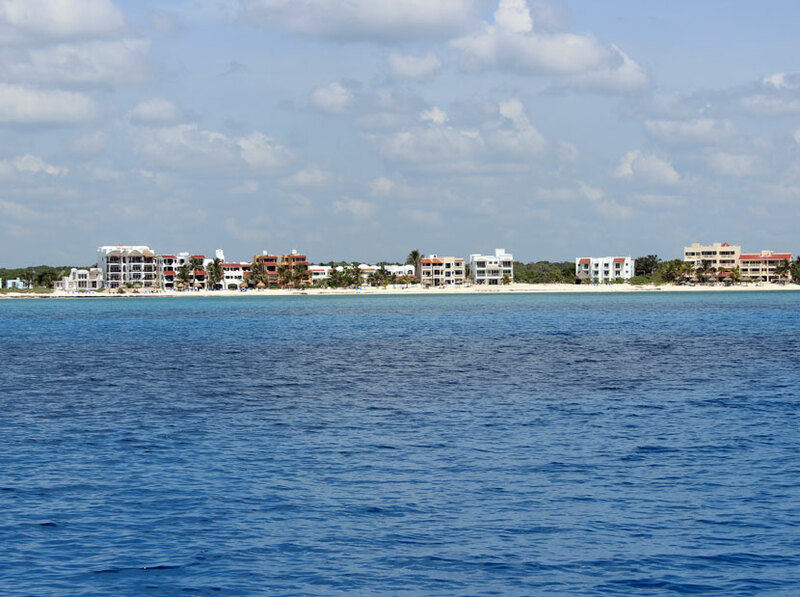 Located approximately 2 kilometers to the south of Akumal’s main entrance, South Akumal is a bit far to walk to Akumal’s main area, easily taking 50 – 60 minutes walking along the shore. When driving, exit South and drive north on coastal Hwy. 307 for about 2 kilometers, to Akumal’s main entrance. Turn right and proceed to Akumal Bay. 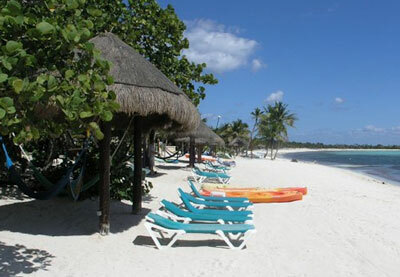 The beach at South Akumal is located on the same stretch of shoreline as Akumal’s main beach, just further to the south. The beach is a crescent of white sand, with a few small patches of rocks scattered here and there. 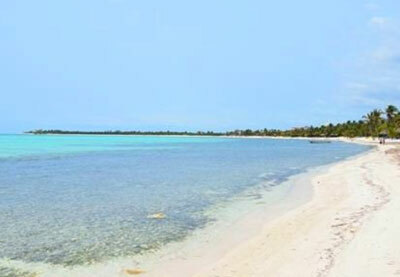 At the northern end of this beach is an area where rock and sand mix and at the southern end is a rocky point, marking the southern end of Akumal Bay. Protected from the open sea by the barrier reef, this beach is typically calm, offering excellent snorkeling directly in front. This beach is primarily used by guests staying at South Akumal, therefore, it is typically a very quiet beach without crowds, even during Akumal’s busiest times. Also, because it is removed from Akumal’s main area, the beach at Half Moon Bay doesn’t attract day visitors, as does Akumal’s main beach. 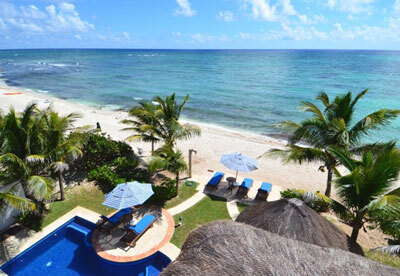 South Akumal is home to numerous private villas and several low-rise condominiums properties. Akumal’s main area is a 50-60 minute walk along the shore, therefore, a rental car is needed when staying at this location. Much like Akumal’s main beach, the barrier reef in front South Akumal has created a shallow, protected area, providing excellent snorkeling that is easily accessed directly from the beach. 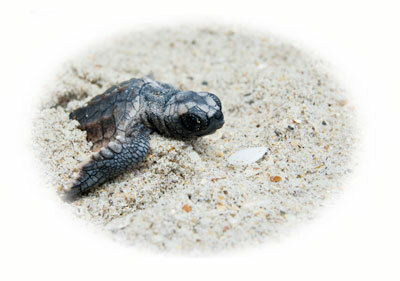 Inside the bay, snorkelers can see a wide variety of coral, tropical fish, and sea turtles. Located approximately 3 kilometers to the south of Akumal’s main entrance, Aventuras Akumal is one bay to the south of Akumal Bay and is accessed via its own entrance off of Highway 307. A rental car is needed when staying at this location. To get to Akumal from Aventuras Akumal, exit Aventuras Akumal and drive north on coastal Hwy. 307 for about 3 kilometers, to Akumal’s main entrance. Turn right and proceed to Akumal Bay. 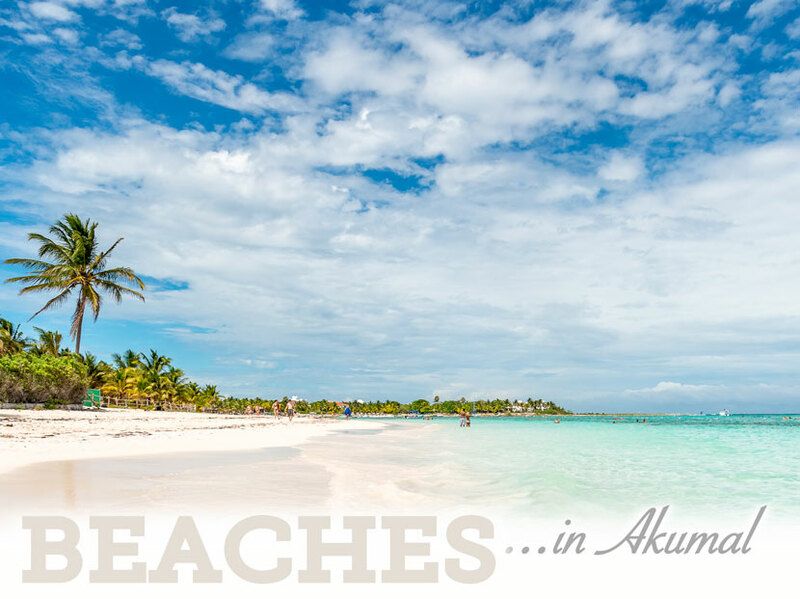 The beach at Aventuras Akumal is a gorgeous crescent of white sand. At the northern end of this beach is an an All-Inclusive resort and then a rocky point. At the southern end is another All-Inclusive resort, and then the beach marrows and begins to mix with rock. Although protected from the open sea by the barrier reef, the coral is a little deeper beneath the surface of the sea here, allowing waves to partially rebuild in height as they cross the bay and approach the beach. When seas are calm, there is very little surf and when the seas are choppy, waves break at the beach line. Aventuras Akumal is home to numerous private villas, several low-rise condominium properties, and there are All-Inclusive resorts at each end of the beach. There is one dive shop on this beach, but there are no restaurants or other amenties. 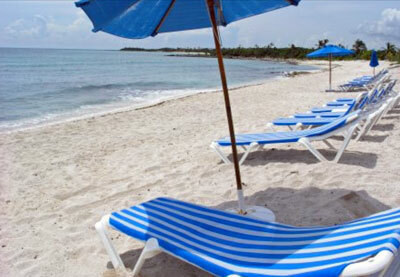 With a rental car, Akumal’s main area is within a 10 minute drive on coastal Highway 307. The barrier reef in front Aventuras Akumal offers excellent snorkeling that is easily accessed directly from the beach. When seas are choppy, producing waves at the beach, walk northward a short distance along the shore until reaching calmer waters. 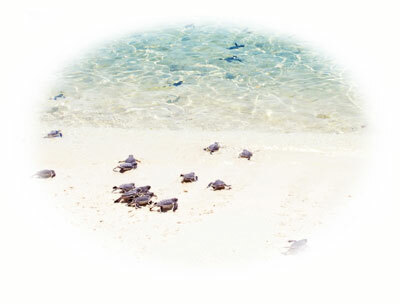 Inside the bay, snorkelers can see a wide variety of coral, tropical fish, and sea turtles. Located approximately 98 kilometers south of the Cancun airport and 25 kilometers to the south of Akumal, Soliman Bay is between Xel-Ha eco-park and Tulum. A rental car is needed when staying at this location. 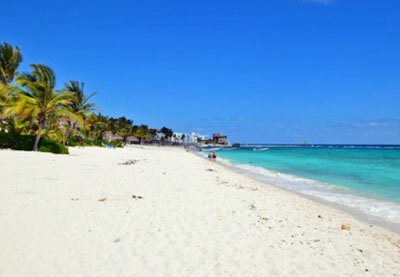 Approximately 8 kilometers to the south of Soliman Bay is Tulum village. 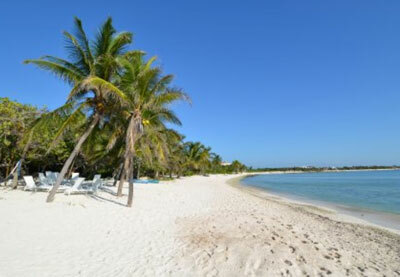 The beach at Soliman Bay is a gorgeous crescent of white sand. At the northern end of this beach is a rocky point and at the southern end is the same. Protected from the open sea by the barrier reef, Soliman Bay is very large and offers e xcellent snorkeling. however, the distance from the beach out to the barrier reef is further than in Akumal, but is still within swimming distance for a good swimmer. It can also be reached on a kayak, which most of the properties at this location provide. This beach is typically a quiet beach without crowds, even during busiest times, as visitors must stop at the entrance gate and present their Accommodation Voucher showing that they are staying at Soliman Bay in order to enter. Soliman Bay is home to numerous private villas and beach bungalows. There is one restaurant, but there are no other amenities such as dive shops, convenience stores or grocery stores. With a rental car, Tulum village has these amenities and more and is within about a 10 minute drive to the south on coastal Highway 307. 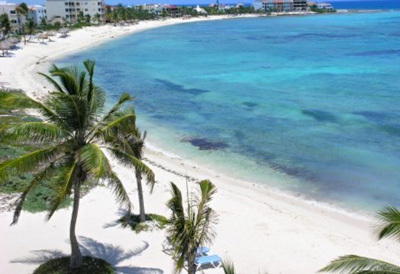 The barrier reef in front Soliman Bay offers excellent snorkeling which can be accessed directly from the beach, however, the distance from the beach out to the barrier reef is further than in Akumal, but is still within swimming distance for a good swimmer. It can also be reached on a kayak, which most of the properties at this location provide. The sea is very shallow at the waters edge and continues to be shallow for quite a distance, very gradually deepening the further out that you go. 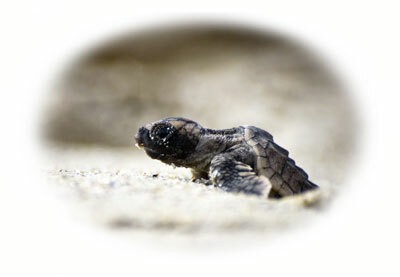 Please note that the dark areas in the water in the above photo is Turtle Grass which is not harmful. If you find it bothersome to walk on, most properties have a narrow pathway from the beach to the other side, where you can put on your mask and fins and begin snorkeling. Celebrating 26 Years of Service! Copyright © 1989-2019 Akumal Vacations all rights reserved.